Documenting the greatest triumphs of the nation and some of its darkest days, the manuscript collections contain rich sources on military history stretching from the French and Indian War through World War II. Collections are wide ranging and include the letters and pocket diaries of common soldiers, the official and private papers of commanding officers, and official documentation such as orderly books, muster rolls and regimental records. Within this vast subject are the papers of men such as Horatio Gates, Alexander McDougall, Richard Varick, Friedrich Wilhelm von Steuben, Franz Sigel, David E. Cronin, G. Creighton Webb and James Harbord. 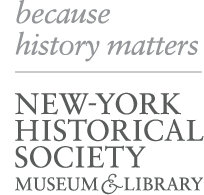 Among the groups and organizations represented are the 7th Regiment, the United States Military Philosophical Society, the Union Defense Committee of the City of New York and the Naval and Military Order of the Spanish-American War. Of particular note is also the Naval History Society Collection which captures the history of the American Navy from the American Revolution through the Civil War and contains a collection of John Barry manuscripts as well as the papers of Gustavus V. Fox, John Ericsson, Henry A. Wise and many other significant naval figures.